Bending The Bars uses yoga as a mindfulness practice to engage prisoners at NORCOR jail in The Dalles with their bodies, increase sensitivity toward oneself, and build empathy for others. By helping youth, men, and women to get in touch with their bodies, they begin to care more about themselves and understand the harm they have caused. This program also aims to decrease the recidivism rate at NORCOR and allow for an easier, positive transition back to the home and community. The majority of NORCOR prisoners suffer from chronic interpersonal trauma which is held deeply in the mind, and perhaps more importantly, in the body, resulting in the dissociative effects of impulsive/reactive behavior and tendencies toward drug and alcohol addiction, as well as violence. Traditionally, cognitive behavioral therapists have helped people process unresolved trauma. More recently, psychiatrists, psychologists, and clinical social workers have acknowledged that embodiment practices such as yoga enriched with mindfulness practices can have more impact in alleviating the symptoms that lead to both reactive behaviors and stress-related disease (Prison Yoga Project). Program participants learn self-soothing skills and have opportunities to work on flexibility and movement in an otherwise limited physical environment. With each class beginning with introductions, injuries, and a unique get-to-know-you question, community and interpersonal connections grow. This can be seen very powerfully in Juvenile Hall, since youth are otherwise unable to converse during day to day confinement. By creating more community in Juvenile Hall, we’re able to deconstruct a fear culture and promote a culture of support. The youth realize that they have built up scary stories in their heads about their peers when, in fact, they are all in similar situations and each have many challenges. Bending The Bars teaches mindfulness activities including: yoga, mindful speech, and meditation. The program utilizes Cognitive Behavioral Therapy techniques of observance and relaxation through breath work and observance of thought patterns. We practice physical body awareness and strengthening through the incorporation of breathing through physical postures and movement. Individuals are challenged to notice negative thought patterns as they come upon more challenging postures, and in so doing connect their thoughts to their physical environment and body. We partner with NORCOR administration and guards to offer weekly classes during time served in jail. Classes are free and are not mandatory to attend. Every class starts with a short meditation and guided relaxation breathing which is then followed by continued awareness of thought patterns and breath as physical postures are introduced. Every class ends with a guided relaxation. Participants are encouraged to notice their emotional state before and after class to make their own connection about how their mental state affects their physical state and vice versa. The Gorge Magazine, Spring 2018 - Yoga on the Inside. A new program at NORCOR brings weekly yoga classes to inmates in The Dalles....read full article here. One female prisoner says she feels so strongly about the benefits of going that she rallies others to come to class and reminds people when it is happening. Although this participant is now out of jail, she’s attending classes at a studio in the Dalles that offers free classes to people who have been incarcerated. She has been sober for three months. "Yoga is the missing piece I needed to feel grounded." The first time Tay, a Juvenile Hall detainee attended a BTB class, he cracked jokes and had a hard time being quiet. It was obvious the other kids looked up to him. But the second time he went, he sat up front and set a new tone for the class. He would scold new kids if they laughed during class. He would visibly melt into his mat during relaxation at the end of class. Having experienced the transformative power of yoga and mindfulness, Kay Alton was inspired to empower individuals in challenging situations with tools that would help them experience a sense of community, improve mental health and safety, and offer equity in physical activity opportunities. 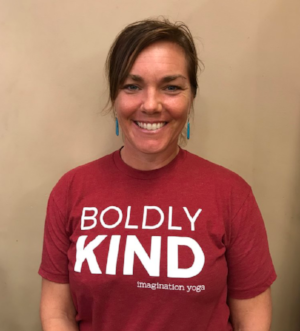 Kay holds a Masters of Education in Youth Developmental Leadership at the University of Minnesota, a Masters of Social Work at California State University, and has completed her 500 hour yoga training in Cambodia through Zuna Yoga. She and the other yoga teachers are trained and experienced practitioners able to communicate effectively and welcome individual diversities of culture, physical needs, and emotional states. Shannon O’Brien is a trauma informed yoga teacher who uses the knowledge of neuroscience, mindfulness techniques and meditation practices to support her students. She started practicing yoga in 2011 and often explains her definition of yoga as a safe place that you can always turn to. Her passion of offering yoga to EVERYONE lead her to pursue a Yoga and Social Justice 200 RYT Teacher Training Certificate and Trauma Informed Brain Sensitive Yoga Teacher Training from the Daya foundation in Portland. Her training has supported her work teaching yoga and mindfulness to people who have experienced adversity, marginalization, oppression, trauma, prejudice, and mental health challenges. Shannon has a Bachelor of Arts degree in Psychology and is currently pursuing her Master's degree in Social work at Humboldt State California. She is interested in offering yoga as an alternative modality for healing, and teaching yoga in different environments such as schools, jails/prisons, hospitals and office spaces. Yoga found Shannon in 2003 and quickly began to change her life from the inside out. In 2004 she embarked on her first Teacher Training journey and she continues to add to her kit of experience and knowledge so that she may share yoga with all ages and abilities. She is honored to be part of the Bending The Bars Program and looks forward to her weekly visits to teach women and youth classes at NORCOR Jail. The gift of mindfulness and yoga that she brings is given back tenfold by stories of value and life change by her participants. Bending The Bars is looking for ongoing program funding to expand the offering of six weekly group classes (two classes a week for each youth, men and women’s groups) as well as offering a weekly class to staff working at NORCOR who are direct service providers. Bending The Bars encourages those who are released to continue yoga/mindfulness classes and we offer free classes at some of the yoga studios in The Dalles and Hood River with the intention to increase locations for post-jail practice as financial support grows. Your support will help us extend the transformative and healing power of yoga to populations who can most benefit.